Today’s Dynamis was Beaucedine, and we rocked the zone big time. Killed 3 of the 4 city bosses and got 21 AF and 2 100s to show for it all. Ended with time to watch most of the Super Bowl too. At one point we had 4 AF in the pool! But what was awesome about this run for me is that I got Valor Breeches from it! Over all, great day. Now to work on shield skill, orz. 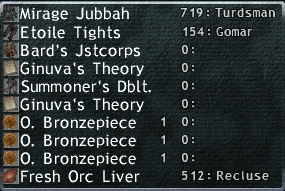 Previous Post: Finally, Level 75 job #2!